Calhoun Truck Lines has a relentless focus on driver safety. In a variety of ways, our safety department strives to maintain high levels of our trucker’s safety on the roads. Check our blog for details on these driver safety measures. And when the weather conditions and driving conditions become a detriment to this safety, it becomes important to share our insights into keeping our drivers safe from poor weather-related driving conditions. Last week’s frigid temperatures’ across the middle of the United States had a forceful impact on our Midwest trucking operations in Detroit, Minneapolis, Chicago, Indianapolis, Columbus and Omaha. Our shipments decreased, and drivers were on extra high alert for any mechanical equipment failures with their trucks. 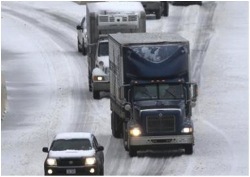 Weather of the fierce magnitude that hit the U.S. recently can also have a serious economic impact on trucking and the U.S. freight transportation industry. In a recent study “The Weather Business” an insurance company found that it cost U.S. airlines and trucking companies anywhere from $3 billion to $3.5 billion for the cost of weather-related delays. But more than the economic impact that’s high is the potential toll of the human impact. It is the responsibility of our Calhoun Truck Lines safety department to make sure we maintain a high level of safety for each truck we put on the road. That’s important in all types of weather, from extreme summer heat to below-zero winter cold. Our trucker’s safety and condition of our cargo was first and foremost on our minds, in the most recent winter cold that gripped Midwest and much of the rest of the US. Thankfully, our drivers and the trucks they drove in sub-zero temperature came through OK. We stayed in contact with our drivers, and found that close communication was essential in getting our cargo to its chosen destination. By working with good working trucking equipment, knowledgeable drivers and key coordinating staff, we found that you may not be able to beat Mother Nature, but can do well enough in spite of her ferocity.